FF3 is phenomenal. I might count as a Nintendo-only FF fan, but "fan" might be a stretch because I really haven't paid attention to the series post-IX (give or take a Theatrhythm). I'd probably put Dragon Quest above it as a whole. (All are the Smash versions except Mario) I practically cleaned out their entire pre-owned amiibo section! I think the only ones left after I got done there were Celeste from Animal Crossing, Toad and another Fox. I hadn't planned on buying more amiibo but that price was too good to pass up. If you don't mind not having the amiibo boxes, check around. Zelda BotW amiibo are live on Amazon (except Guardian). I still need to get all of the new Zelda ones. I think the Kirby ones stunk up the show. As always. Freakin' Kirby. 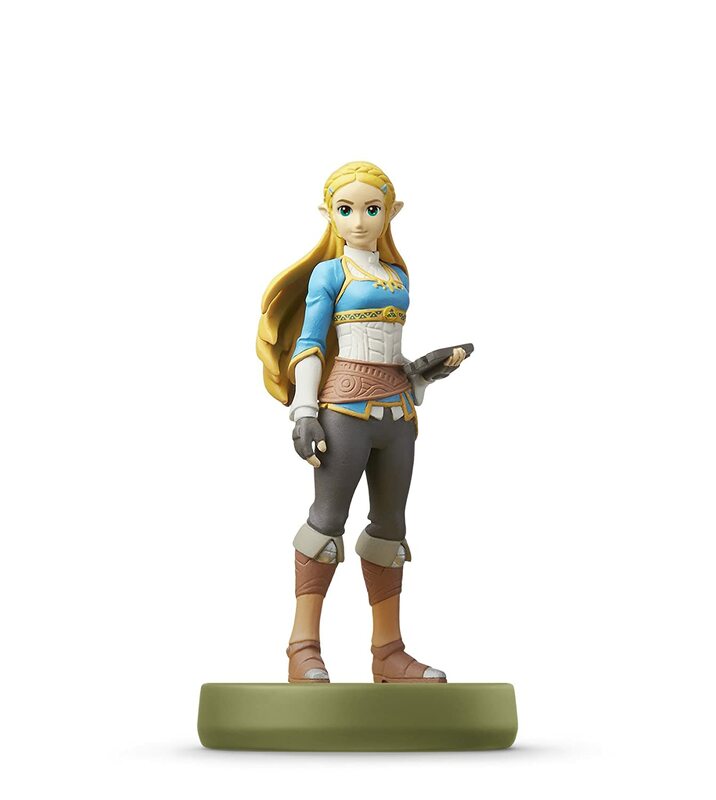 I don't love some of the BotW amiibos because they went back to having those ugly plastic supports to facilitate ugly poses that can't stand on their own. But, I freaking love the Zelda Amiibo. She's gorgeous. What an amazing character design. I'm sorry Tetra but this might be the best Zelda design ever, she's gonna look so good next to the OoT Link. I agree. I love the new Zelda design. Right now I have 95 of the amiibo currently out in the US. I still don't have all of the first line of Super Mario amiibo (and Daisy), but those should be easy to get. The hard ones are going to be the rest of the Smash Bros. amiibo, the ones I'm missing are Bowser Jr., Donkey Kong, Diddy Kong, Ike, King DeDeDe, Meta Knight, Rosalina and Luma, Sheik, and Yoshi. Other than that, it's just the Alt Colors of the Splatoon 3-Pack and the Skylanders ones (though I don't really care about those). So I'm pretty close to a complete collection. I'm up to 99 of these crazy things. Holy crap, that's a lot! I have a few more coming in the mail and a friend that bought me one from a store he went to for a rhythm game tournament. That makes me very close to having a complete set. And then the Poochy, BotW and Fire Emblem ones not out yet. Also missing the Skylanders ones that aren't the regularly-colored Donkey Kong, but I don't care about those as much. If anyone has some doubles or something to sell, let me know! I have a Meta Knight, but I think Graptakular needed it. Or Ludist. Its been a long time, and I'm horrible. PS- Yoshi is upset with you. Yeah, I might have to snag BotW Zelda myself. Are those Zelda amiibos releasing alongside BotW and the Switch? I have a Meta Knight. Both of them. Yes. I have one of the Links and Zelda pre-ordered. If my math is right, I have 111 of 124 out now. I don't like my odds to find any of these on store shelves, but after a cursory search, it doesn't seem I'd have to really break the bank to get any of them online. A bit of a premium, sure, but nothing too outrageous. I'm debating on whether to try and get a 'new' Link. I may grab a new one and keep him in his box prior to one final search. If the original turns up I guess I have one of those mint in box figures, lol. In the meantime, I think I want to grab a few more of the Zelda line for collection purposes. I have Wolf Link via my TP HD box, and I have Archer Link on preorder. So I'm thinking of grabbing Ocarina Link and maybe Smash Ganondorf and Smash Zelda too. Are the Mario Series DK and Diddy easy to find in the U.S.? They never restocked them in Canada since their release, and they were very hard to come by from the get-go. Now that you mention it, I don't know that I've ever seen Diddy in stores. I have seen DK often in my travels (mostly looking for a second NES Classic controller). I got a Lucas Amiibo for like $5 last week. He's definitely one of the nicer looking Amiibo I own. I'll give him that much. Awesome! Where'd you find it for so cheap? Both him and Ness are really good looking. Though for my money, in the Smash line, Mega Man is still my favorite. @ludist210 both the Smash and Mario Party versions of Bowser are really nice as well.